13.5% alc., $15, screw cap. “Aristocratic wines at democratic prices.” · Aromas of ripe red berries which are slightly confected and herb-kissed. Crisp and juicy with reserved tannins and a lively touch of citrus zest on the finish. 13%, $20. 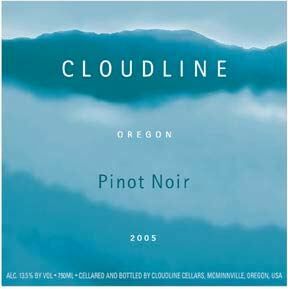 From 6 dry-farmed vineyards in the northern Willamette Valley including clones Dijon 115, Wädenswil, Pommard and Upright. Myron Redford and Darcy Pendergrass are the winemakers. · On the nose there are strawberries, cherries, juicy fruit gum and a touch of cardamon spice. 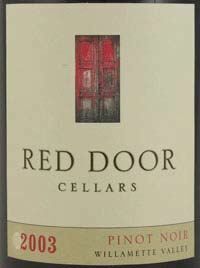 Light-weighted and nicely spiced red fruits with some cedar and grapefruit zest flavors, soft tannins and zingy acidity. 13.6% alc., $24. · Light ruby color. Prominent oak char and dark caramel on the nose. Oak and toastinfused black cherry fruit which is light and juicy. No tannins to speak of and adequate acidity. This wine will appeal to those who like oak with their Pinot. 13.6% alc., $23 (winery retail is $30). · Moderately light reddish-purple color. Shy aromas of cherries and wine cave. Red fruited with bright acidity and a touch of citrus on the zesty finish. A simple but satisfying drink that is nicely crafted. 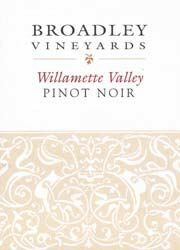 13.5% alc., $20 A blend of several vineyards from a consistently well-regarded family owned winery producing 5,000 cases of Pinot Noir annually. Located in Monroe, Oregon, about half way between Corvallis and Eugene. 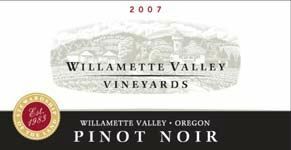 · A middle weighted Pinot Noir offering slightly roasted and sweet dark berry fruits accented by clove, oak, maple syrup and balsam. Lively acidity on the refreshing and dry finish. 13.2% alc., 500+ cases, $26. From plantings of Dijon, Pommard and Wädenswil clones in Philomath, Oregon. The best 21 barrels in the cellar. Aged 18 months in French oak barrels. Unfined and unfiltered. · Very ripe dark fruits are featured with hints of raisin and port, stopping short of prune. Deft touch of cardamon and clove spice. Very smooth mouthfeel. Well-crafted but the fruit is a little riper than I prefer. 14.5% alc., 391 cases, $24. 80% Gamay Noir, 20% Pinot Noir. “Cerise” is cherry in French. This wine is analogous to passetoutgrains in Burgundy which is made for drinking while the highly structured Pinot Noirs develop. Cerise has been produced since 1992. There are two acres of Gamay Noir planted at Ridgecrest Vineyard, a 55-acre planting on a 176-acre property which pioneered grape growing on Ribbon Ridge in 1980. Aged 9 months in barrel, racked twice, sterile filtered. · The nose is restrained, showing blue and black berries, oak and some good barnyard. The wine offers black grape flavors with respectable richness and body. Anise and pepper notes add interest and the dry finish has a spirited grip of citrus zest. A good change up from the sea of Pinot Noir. 13.5% alc., $16.50. A project of Dreyfys, Ashby & Co located in McMinnville, Oregon. The consulting winemaker is Véronique Drouhin-Boss of Domaine Drouhin. · Aromas of spiced fruit compote, especially cherry, with a hint of oak and acetyl. Red fruit driven, soft and silky with supple tannins and a dry finish. 13.0% alc., $19, screw cap. 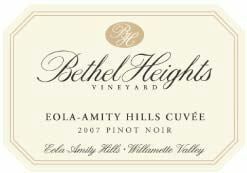 A blend of different vineyard sites in Oregon. 95% micro-oxygenation, 5% French oak barrels. · Moderately light red color. Scents of cherries, oak and green herb garden carry over to the flavors which are crisp, fresh and tart. Fairly austere and light with no detectable tannin. 13.5% alc., $22.50. Michael Beckley, the winemaker, says on his label, “In wine as in music, I believe there is a sweet spot. A point of balance and finesse that is reached when passion and skill, knowledge and dedication are applied in equal amounts.” · Restrained aromas of crushed winter berries and good barnyard. 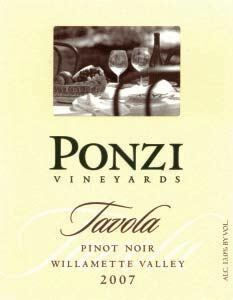 Simple and light black cherry flavors with an appealing smooth texture and modest t n’ a. 13.0% alc., 4,674 cases, $20, screw cap. This second label of Daedalus is named after a biblical whore. 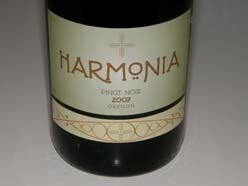 This wine is a blend of several vineyards and is crafted by winemaker Aron Hess. Fermented in 60% stainless steel, 5% new and 35% neutral French oak. 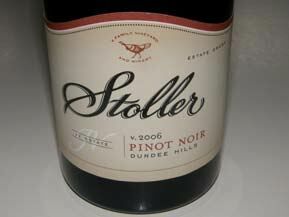 · Lightly colored with very demure Pinot fruit flavors. Oak char and herbs are to the front. Light and silky. 12.5% alc., $18. Crafted by Matt Kinne, a respected winemaker trained at Hanzell in California before returning to his family's farming roots in Oregon. · Shy floral aromas with added darker fruits and a bit of funk. 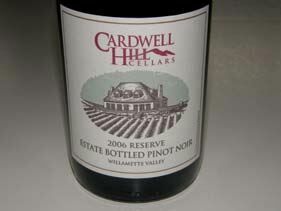 A middleweight with some richness on the mid palate core of berry and cherry flavors. An elegant wine with a grippy finish featuring a lemony zest. 13.0% alc., $20, screw cap. From Olsen Family Vineyards who farm about 450 acres in five distinct vineyards in the hills between Monmouth and Corvallis, Oregon. The family has farmed in the Willamette Valley for five generations. · Very shy and nondescript aromas with a hint of cherry and camphor. More pleasing in the mouth with hearty and deep wild berry flavors with a sidecar of dark chocolate. The tannins are reigned in and the wine drinks easy. 13.2% alc., 5,104 cases, $25. A blend of sixvineyards and consisting of all LIVE Certified Sustainable fruit. After an extended cold soak, fermentation continued was driven by native yeasts. Aged in 25% new French oak for 11 months. Following a barrel selection, the wine was racked and bottled by gravity without fining or filtration. 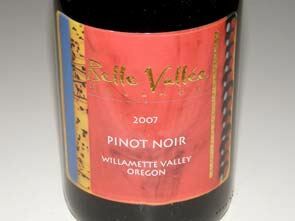 · A mid-weight wine with nicely spiced red cherry aromas carrying over to the flavors. Silky textured with fine tannins and a refreshing finish with lively acidity. 13.5% alc., $21 (I have seen it on the internet for $18 which is a steal). Crafted by Laurent Montalieu for NW Wine Co. (Precept Brands) in McMinnville. · Herb-dusted red fruits, sage, bay, oak and char on the pleasing nose. Very light, even ephemeral, with red cherry and strawberry flavors touched by herbs. The fruit is well-supported by supple tannins. Goes down like mother’s milk. My only nit is that the finish ends in a flash. 14.5% alc., $22. Estate grown grapes from younger hi-density vines. · Nicely spiced cherry fruit forms the basis of this medium body wine which is accented by flavors of toasted brioche and oak. Good balance of t n ‘a. The oak peeks out more as the wine warms in the glass.